the dropdown would have years, months, weeks and days and then a textbox to enter the value. 1) Exposes the options, rather than hiding them in a drop-down. 2) Reduces number of clicks to give a response. 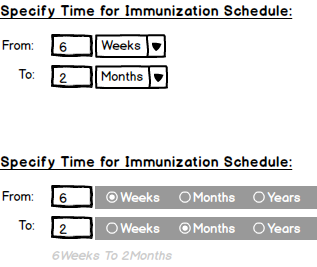 If it's for immunisations, and we know they occur at a set number of stages, can the two dropdowns not simply be an ordered list of options such as "Birth", "6 weeks", "2 months", "6 months", "1 year", "2 years" etc? That way you don't need the separate weeks/months/years control and it's easier to read. It'll depend on whether your users need the extra flexibility to enter values like "7 weeks" or "11 months". Not the answer you're looking for? Browse other questions tagged forms gui-design design or ask your own question. What is the best interaction pattern for entering a range on a mobile phone?